How to prevent Firefox updates per app version (preferences outside of profile folder)? ... and it doesn't even ask me, which I find extremely disrespectful. The problem here is that at startup, even this version uses the "Default User" profile that my normal system Firefox uses. Now I could set up a separate profile folder just for this Firefox, but then I have to manage more things - which I don't find worth the effort, since all I want to do anyways, is just to stop the updates. You can create a new file in a text editor ... called user.js ... Place this file in your Profile Folder. Well, I thought, if this file is read, then I can just add the preferences to stop updates here? ... but still no dice - again Firefox starts updating immediately once I see Help/About; and even about:config indicates that these preferences have not changed from their defaults. 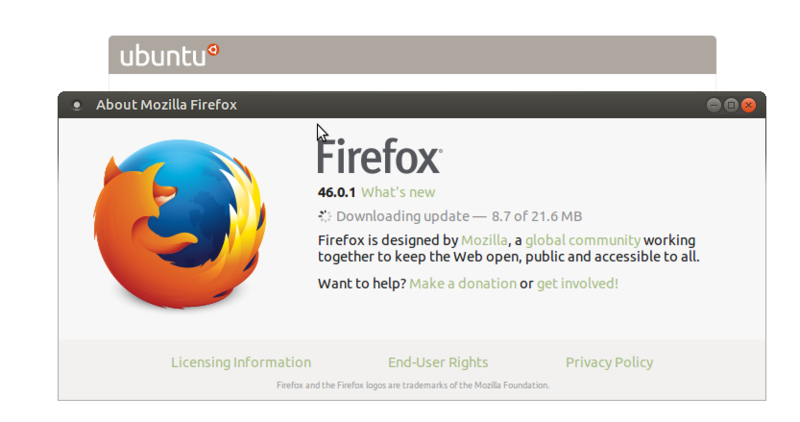 So, is there a way to stop the updates of this "extern" version of Firefox on "application" level (i.e. in its application folder), such that is still uses the "Default User" profile otherwise user by the main Firefox version? You can simply delete Updater executable in the firefox folder. No more updates. Ever. Not the answer you're looking for? Browse other questions tagged updates firefox or ask your own question. How can I prevent firefox from updating?